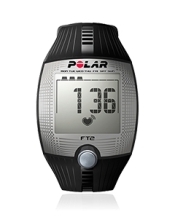 The Polar FT2 heart rate monitor is a basic training computer for those who just want to monitor their heart rate while exercising or while performing other daily activities. The extra large digits make for easy viewing. The "Automatic Age-Based Target Zone" is an added feature over the FT1 heart rate monitor. It records your average and maximum heart rate and displays a summary of your latest workout. To help you train safely and effectively, the training computer automatically determines your heart rate target zone limits according to your age-based maximum heart rate (220 minus age). The limits are determined in beats per minute (bpm). See also Manual target zone. Heart rate is the measurement of the work your heart does. Heart rate is expressed as the number of beats per minute (bpm). This feature enables you to manually enter the target zone that is suitable for your training. You can set the target zone for your training as beats per minute (bpm). This heart rate watch is for recreational exercisers who want an easy start to fitness.